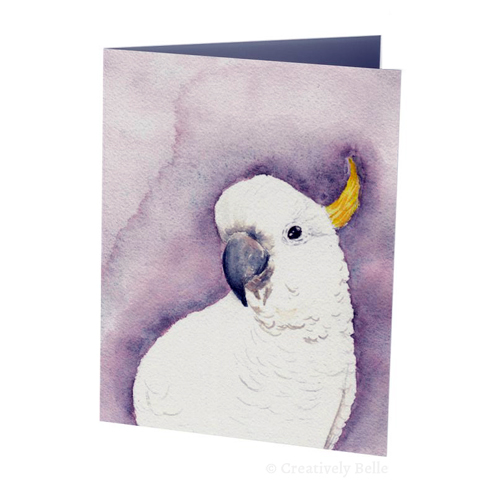 Creatively Belle has our retail outlet in one of the most beautiful and vibrant cosmopolitan markets in the world, The Rocks Markets with our weekly market stall with our stationery and jewellery on Saturday and Sunday 10am – 5pm. Because our jewellery and stationery designs are made by hand here in Sydney during the weekdays and because Belinda would go nuts inside the same four walls of a shop day in, day out, you won’t find a dedicated Creatively Belle shop on the streets of Sydney (rents are too impossibly high for local artisans to do this anyway!). 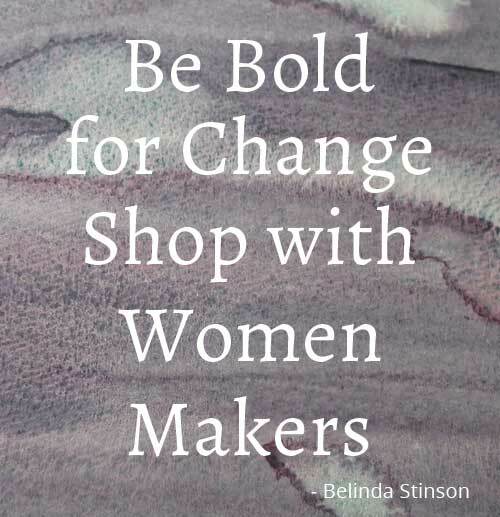 Hence you’ll find Belinda and her captivating designs in the inspiring environment of truely artisan markets and fairs. 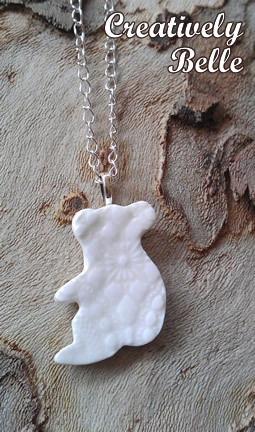 Each weekend Belinda takes to The Rocks Markets her locally made necklaces, earrings, bracelets and brooches made from Southern Ice Porcelain, freshwater pearls or artisan lamp work glass and locally printed stationery. 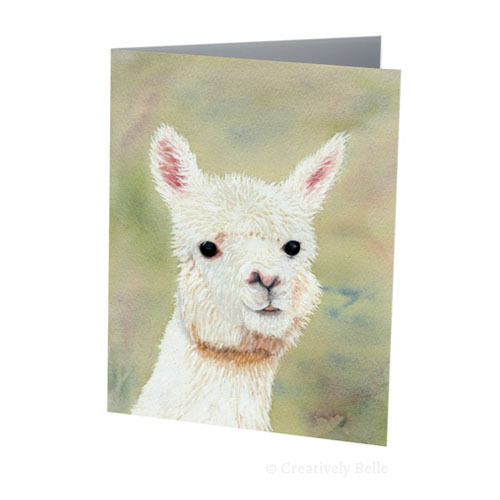 You will find a much larger range of Belinda’s designs at market than you will here online simply because Belinda does everything and has to find a balance somewhere (a typical small creative business issue!). 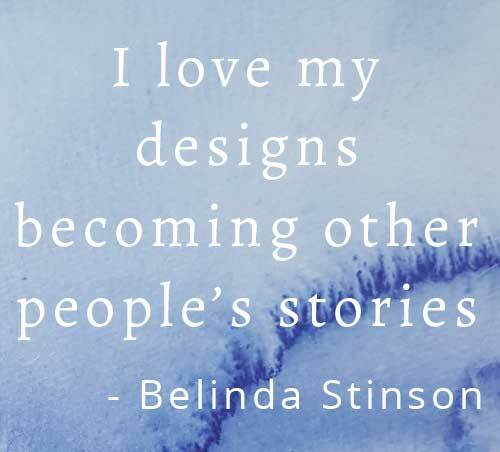 For an insight into the real daily life of what it takes to make your living from your creativity Belinda’s blog is full of behind the screens views, practical tips, real life experiences and helpful guides so you too can enjoy more creativity in your daily life. 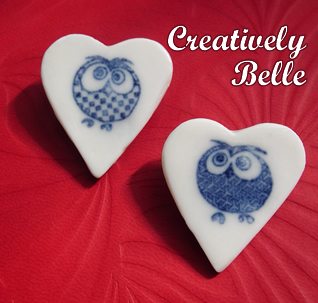 Join the Creatively Belle email newsletter for regular designs and stories updates. When you’re visiting Australia The Rocks Markets is always on everyone’s 5 Must Do Things in Sydney and that’s for the really simple reason that it is the home of local creativity and artisans showcasing their work. So it is no surprise that you’ll find us at The Rocks Markets opposite the cafes in Playfair Street. Playfair street is just off Argyle Street. Come explore this lovely vibrant market and enjoy the city on a relaxed weekend exploration with stunning views of Sydney Harbour Bridge. Markets are a great way to get an authentic feel for a city and it’s creators – the makers and designers who want to stay connected with the making process of their work and also get to know their customers. “I think markets bring a city to life with their vibrant atmosphere with locals and visitors mingling together, enjoying local artisan crafts and designs and discovering some delicious food too! But then, I’m a market girl, I love the community of makers I’m part of and being part of an amazing pop up shopping experience each week. “I have my full range of porcelain earrings, brooches and necklaces and stationery at The Rocks Markets – including some patterns that aren’t featured here on the online shop (they are all unique patterns and images become rather tricky online)”, explains Belinda. 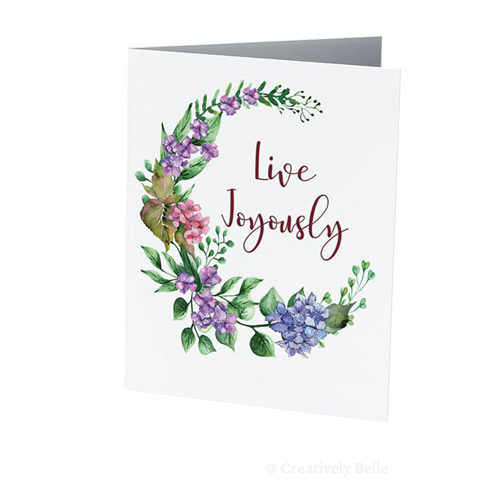 The Creatively Belle Twitter , Instagram and Facebook pages have the latest market news and special offers so you’ll always know where to find us. We have a permanent stall at The Rocks Markets so are in the same location every weekend. The Rocks Markets every Saturday and Sunday 10am to 5pm in Playfair Street opposite the cafes – off Argyle Street and the other end is off George Street. This is a great market full of talented designers and creators so come visit and be delighted. 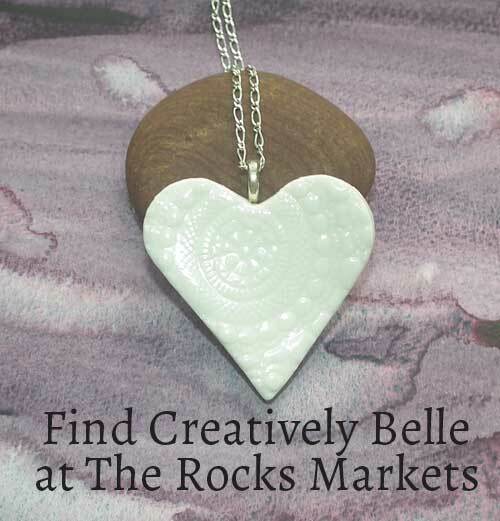 And of course, do some jewellery shopping at The Rocks Markets with Creatively Belle! We will be at a select range of other markets and fairs this year and updates will be made via the blog, Instagram, Facebook and Twitter. I love heading off to Tasmania every year, it’s one of my annual highlights, so I delighted to be accepted for the Tasmanian Craft Fair again this year. The Tasmanian Craft Fair at Deloraine in Tasmania Friday 1st and Saturday 2nd, Sunday 3rd and Monday 4th of November 2019. 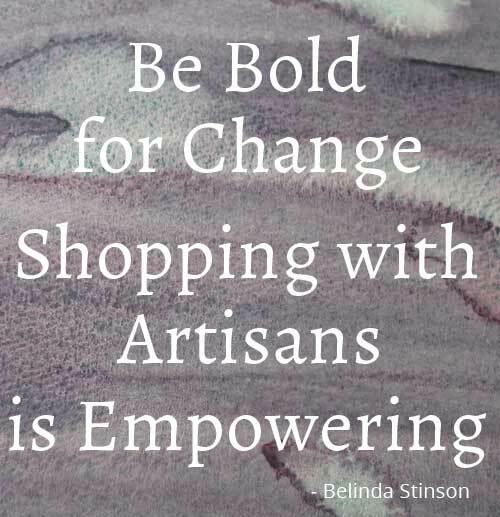 This is a fabulous gathering of talented artisan makers from across the country. 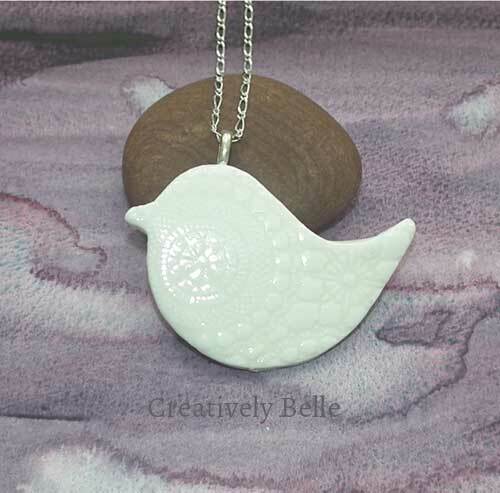 Since 2010 Creatively Belle has been exhibiting at the Tasmanian Craft Fair in this stunning part of the country. Vivid Sydney is an annual event that runs 3 or 4 weeks (might be longer as they do keep extending it) in the run up to winter. It has a significant impact on The Rocks Markets and our trading hours, changing them from 10am – 4pm and a few stallholders, usually myself included, staying on for the night market that finishes at about 10.30pm. From a visitor’s point of view the upside is the day market is much more quiet as Sydneysiders don’t come in during the day, making the crowds much smaller for all. This also means parking is easy during the day and with lots of carparks just near the markets on weekend rates – $15 to $25 per day. I’ve found over the years that I still pay $15 whether I park my car at 8am and leave at 11.30pm or my regular 5.30pm. Access to the car parks is of course much harder with all the road closures that shut off access The Rocks streets from 5pm on all the many vivid Saturdays. The police do allow cars to easily exit the car parks through the road closures. Here are 10 useful and practical tips for enjoying Vivid Sydney.